The 2019 Class of the Minnesota High School Basketball Hall of Fame. 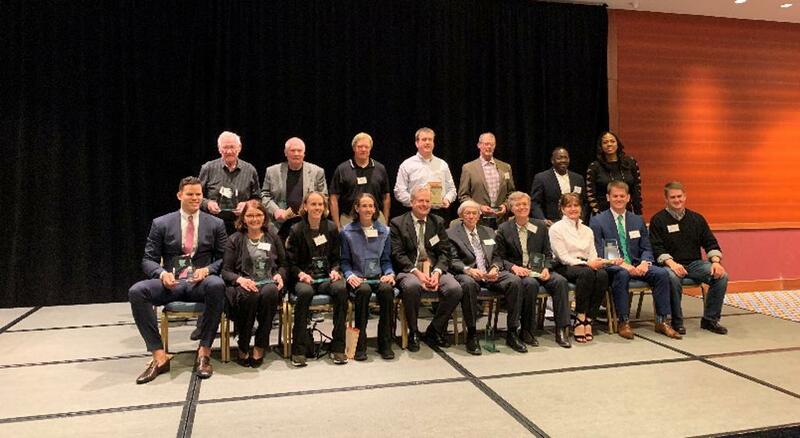 The Minnesota High School Basketball Hall of Fame inducted 15 new members into its ranks at the Marriott City Center Ballroom in Minneapolis on Tuesday. Some of the finest players and coaches to ever step foot on a Minnesota high school basketball court were in attendance for the event, now in its second year. Eleven players in total, including former WNBA forward Tracy Henderson from Minneapolis Henry, retired 13-year NBA center Kris Humphries of Hopkins, and the Miss Minnesota 1997 sister duo Kelly and Coco Miller of Rochester Mayo were added to the list of seven inducted last season. The Miller twins, who won two high school state tournaments together before playing for Georgia, were the first athletes to share the James E. Sullivan Award for most outstanding amateur athletes in 1999. They were both taken in the first round of the WNBA draft, and have since moved back to Rochester where Coco works at the Mayo Clinic. “It’s pretty special when you have someone you can share different experiences with, and I think we just played together for so long, and we just knew each other’s game so well that it just made playing together fun, and we pushed each other to be the best,” Kelly Miller said. The family of Edina center Bob Zender, who led the Hornets to a 79-1 record and three straight state titles from 1966-68, accepted his award. He died in 2010 because of complications from surgery. Zender played at Kansas State and later started a family in Kansas after the legendary Edina championship run — he averaged over 20 points per game in state tournaments. Bob Zender Jr. said his father didn’t talk much about the state titles. The other four inductees were coaches. Current Hopkins’ coach Ken Novak Jr. was inducted after 37 years as a head coach. He’s led Hopkins to eight titles, the most recent last weekend in Class 4A. He won his first state title in 2002 with Humphries. Other inducted were: Bob Brink, Cold Spring Rocori boys' coach, Bob Bruggers, Danube, Mike Dreier, New London-Spicer girls' coach, Norm Grow, Foley, Hal Haskins, Alexandria and Hamline, Ronnie Henderson, Marshall-University, Aileen Just (Luther), Rapidan, Ed Prohofsky, Marshall-University boys' coach and Kelly Skalicky, Albany. Jack Warrick is a University of Minnesota student on assignment for the Star Tribune. The Rams' 5-8 senior guard, who played in five consecutive state tournaments, was selected for the honor from a group of five finalists. The Miss Minnesota Basketball award-winner will be announced Friday while 41 of the state's top seniors participate in two games Saturday in Northfield.